The artist Mark Rothko, best known for his abstract paintings featuring intense blocks of colour, was born in 1903 in Daugavpils, today the second-largest city in Latvia, near the country’s borders with Belarus and Lithuania. He would have known it as Dvinsk, the name it officially bore until Latvian independence in 1918. British artist Dillwyn Smith’s 2013 project The Windows tried to come to an understanding of Rothko’s work and psychology through an unusual route – photographing the multi-coloured windows of the wooden houses of Daugavpils, and turning them into artworks. He also later returned to the theme of Rothko’s life in his work Overcharged with Suspicion. Deep Baltic presents exclusive photos of the project, along with Farida Zaletilo‘s overview. The latest works by Dillwyn Smith show his growing interest in organised spatial relationships between colour and form, continuing the tradition of geometric abstractionism. His works hold a dialogue with the colour fields of Barnett Newman, Ellsworth Kelly, Mark Rothko and Blinky Palermo. Overcharged with Suspicion, installation image, 4COSE. London, 2016. Recently, the artist has given preference to stitched works instead of his traditional painting technique. These works emerged from recent working trips to Latvia and Oman, and the impression they made on his working practice. The concept for ‘The Windows’ evolved when Dillwyn participated in the residency “Mark Rothko 2012”. The local landscape, the traditional lifestyle and motifs captured his imagination – this stimulus became the material for new works where impressions obtained from reality are given unexpected interpretations, showing things well-known to us in a new perspective. The indigenous wooden houses of Daugavpils (formerly Dvinsk) with their multiform range of colours turned out to be the happiest surprise for the artist during the September session last year. “It’s amazing what a multicoloured city you live in! I haven’t seen anything like this ” – this is how the city of Mark Rothko’s birth opened before Dillwyn Smith. While going around the areas of Vecie Stropi, Grīva and Jaunbūve, he kept taking out his camera. He was fascinated by the rhythm, the fretted windows and shutters, and of course, by the colours. What he was witnessing and emotionally experiencing, begun metaphorically showing in his works, creating a relationship to the city, and to the Dvinsk of Mark Rothko’s time. Dillwyn came again in the winter to test his idea and see the snow-covered city landscape. He is absolutely convinced that images of Rothko’s native town would have always been in his memory, because we keep our childhood impressions throughout our whole life, and those important first ten years Rothko lived here would have infused his subconscious and resonated later in his paintings through the colours of the newly-painted, as well as the faded and distressed paintwork of the shutters and windows. As a child he would have experienced this on a grand scale as he walked the streets where he began his life. At the symposium dedicated to Rothko’s 100th anniversary, his son Christopher said in his lecture: “The analogy that has often been made for my father’s classic works, is that of a window. The form invites this analogy, in combination with the bright colours and inner glow of many of the 1950s works. But these works are not transparent; there is no light coming in; there is no outside. In fact, the windows have been closed off, bricked up with the most sensuous of colours. These are not windows to look out from, these are windows to look in through. The classic works, through size and a certain seduction, grab the attention, but they offer no vistas. Instead they reflect the inner world of the artist, and they reflect back at us the feelings and reactions we project on to them. These works are an invitation not to step out, but to turn inward. They are in a sense, “windows on the soul”. An individual’s links with their birthplace can be mysterious and deep. 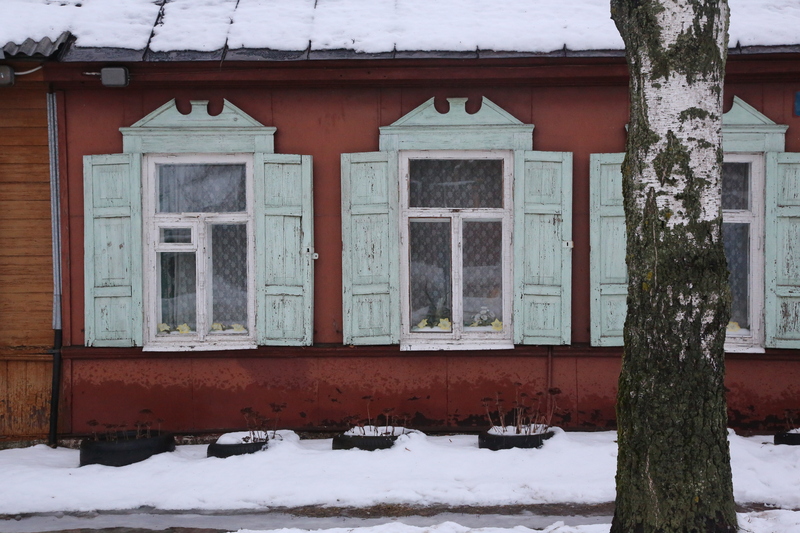 Who knows, perhaps these colorful windows of the small wooden houses of Dvinsk (in one of which the Rothkovitch family lived), returned in Rothko’s pictures of the stone buildings of New York City years later? Dillwyn Smith uses fabrics purchased in local shops. He arrived at the residency in Daugavpils not with paint but cloth, materials bought in a tailor’s shop in Ruwi, Oman bought during a three-month residency from March–May 2012. Some pieces he had begun to get stitched together there but were unfinished. After making his observations of the wooden houses and windows of Daugavpils, he asked to be introduced to someone who could stitch and so begun the dialogue with the ‘city of colour’ though photography and ‘stitched paintings’. In the market here in Daugavpils, he bought new colours, seen in the palette of The Windows 6 and 7, where a metaphor of our landscape can be traced: with its basic blue, green and yellow colors – like in the traditional Latgale ceramics. When choosing the material by its color and texture, Dillwyn is guided by his intuition and sometimes by unexpected associations. For instance, having taken the fabric into his hands, he says: “I remember myself as a small child touching my mother’s skirt, and this feels just like the same material – crimplene, haha!” Colourful strips are stitched in vertical or horizontal composition, like strings. And the compositions of these works themselves are melodic they have rhythm and music. Sometimes they are built on subtle nuances in color, some other time they are polyphonic – like a complex musical chord built on laws of a special harmony. Works by Smith are material and warm – they are hand-made and retain the warmth of the hands. Having noticed a seam that is not quite straight, the artist, smiling, leaves it as it is, as a reference to human imperfection. Affirming themselves in space, these works hold a dialogue with the architecture of the Mark Rothko Centre, a renovated arsenal building in the fortress built by Tsar Nicolas I in 1833, and the photographs Smith took of the local wooden homes. These works draw our attention to the peculiarities of the environment and in doing this they do not tend to emphasise themselves but rather create the feeling of contemplation and peace, because they are oriented towards human measures, towards exploring relationships between people and the world they themselves have created.